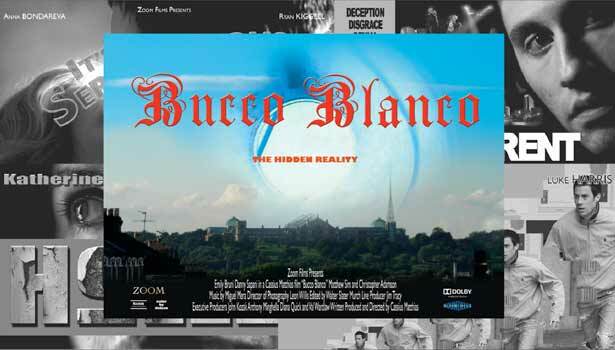 Bucco Blanco focuses on Emily Bruni’s character of Eve, and Danny Sapani’s character of Zak who meet in their favourite place after seven years of separation. This momentous meeting causes a somewhat enigmatic tramp, played by character actor Matthew Sim, to appear on the scene. And so a mystery unfolds. Christopher Adamson (Roman), Martin Blakelock (Tramp Double), Emily Bruni (Eve), Robert Emms (Guy), Patsy Harrison (Model), Rose Heiney (Poppy), Henryk Hetflaisz (Himself), Lucy Morgan (Model), Rahma (Model), Danny Sapani (Zak), Zachary Scipio (Saad), Matthew Sim (Tramp). Storyboard artist Tony Wright created a series of boards for the film; an experience Matthias found invaluable to a deeper understanding of the filmmaker’s art. Here Wright eloquently answers a very important question. “Most people, I imagine, think of a storyboard as a sort of pictorial shot list engendered by the director to communicate how he/she plans to shoot certain action. It can work like that but I would argue that to use boards for that purpose alone would be like keeping a horse solely as a source of fresh manure. The process offers many more possibilities and being the first time a script is rendered in images, far better to think of it as a way to develop visual narrative. A Zoom Films presentation. Produced by Cassius Matthias. Executive Producers, John Kozak, Anthony Minghella, Diana Quick, Val Wardlaw. Directed by Cassius Matthias. Screenplay, Cassius Matthias. Camera, Leon Willis; additional photography, Amy Newstead; editor, Walter Slater Murch; additional editor, Geraint Huw Reynolds; music, Miguel Mera; music supervisor, Sean K. Vibemaker; production designer, Cassius Matthias; costume designers, Anne T. Delaney, Sophie Politowicz; hair & make-up designer, Julie Voloshco; make-up artist, Tian Xu; sound, Gareth John; sound editors, Richard Fordham, Stephen Hart; re-recording sound mixers, Jamie Roden, Mark Taylor; assistant director, Simon Fuller; line producer, Jim Tracy; production manager, Iona Ramsay. Tracks from The Rebel (Aguile Rapus Syhunt and Inca Seudon Tnoiam Agenius), alongside British Grime artists Wretch 32 (Be Cool), Ghetts (Sing For Me), No.Lay (My Way), Loudmouth (Back Of The Cab) and Jeeday Jawz (Swear Down) are woven in with composer Miguel Mera’s original score. Alexandra Palace, above left and right, in the London Borough of Haringey was chosen as the setting for the film’s interiors and exteriors. It took more thank three months of negotiations to secure the iconic location. Known locally as ‘The People’s Palace’ the building, originally built in 1873, serves as a backdrop and perfectly reflects the script’s themes of nostalgia and faded grandeur. Matthias directs cast and crew, above left, on the set of an abandoned clothing factory (now demolished) that was located opposite Arsenal’s Emirates Stadium. Above right, one of the Alexandra Palace interiors dominated by frescoes depicting mythic giants. Entitled Reconstruction-Deconstruction and painted circa 1982 on the occasion of the Falklands War by Argentine artist, Ricardo Cinalli, the frescoes’ enormous scale paradoxically embellishes an otherwise intimate scene between the estranged lovers. The character of Eve, played by Emily Bruni, is introduced in a fashion shoot. Matthias wanted to develop the film’s surrealist theme by grafting the character of the tramp onto the world of haute couture. The ‘tramp chic’ look was created for the Cyber Girls fashion shoot in collaboration with photographer, Henryk Hetflaisz, fashion stylist, Samson Soboye, hair stylist, Jose Quijano, and make-up artist, Norah Nona.